It is not an accident that industry groups, including CEPA and CPAC, chose pipeline construction inspectors as the first step in their recommendations for Companies to implement standardized qualifications as part of their competence management systems. This includes the tasks performed by their sub-contractors, which the Company can accept using a vendor qualification process that examines the contractor’s competency system. To ask industry players to accept and use standardized qualifications, the logical first thought would be to start with the simplest and most common. Consider the basic qualifications that everyone needs and the task specific qualifications for the various positions in design, construction and operation of pipeline infrastructure. Each Company has an obligation to establish these requirements within their own system, but a common qualification applying to the entire industry with a deadline would be an insurmountable task. Imagine if they moved forward with a mandate for everyone involved in the oil and gas pipeline industry was to have a ‘Level 1 Basic Content and Concepts’ code qualification within 24 months. The qualification system wouldn’t handle the volume. There would be confusion created within organizations that have effective code training as part of their onboarding process and the initiative would likely fail. They needed a different entry point. A position within the industry that would have involvement and responsibilities in all three aspects of the pipeline life-cycle, and one that would be able to be used as an effective model to demonstrate the effectiveness and value in the concept. 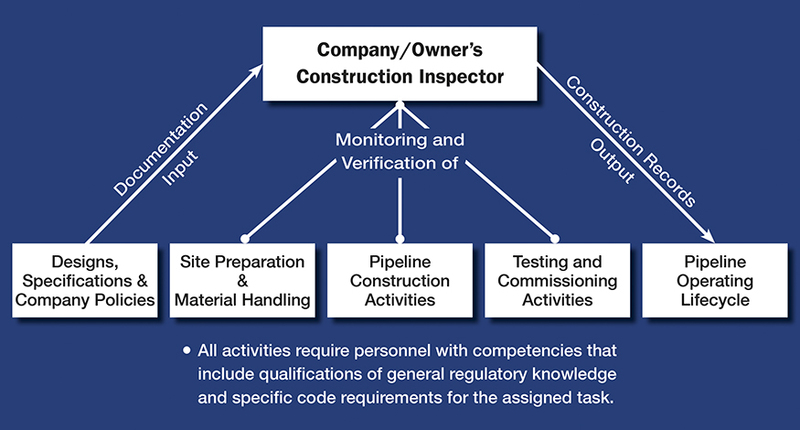 The Company construction inspector became the logical choice because of their inter-relationship with all aspects of the pipeline life-cycle, and their unique responsibility to understand and verify the credentials of others in accordance with the Safety and Loss Management System and Company competence policies. The long-term objective of the industry organizations is to ensure that all personnel have some basic common qualifications that can be used in individual Company’s competence management systems. The diagram identifies a number of tasks sectors within the pipeline lifecycle. While they all require basic understanding of the code and regulatory requirements, individually they have a myriad of task specifics which must also be identified in the competency descriptives. Under the 1169 qualification an inspector is required to understand the Company’s competency requirements for the individual project tasks as identified in the policy and design documents, and ensure only competent personnel perform the specified tasks. The inspectors then provide accurate records of the construction for use by the operating group. As we approach the end of 2018 there are now well over 1000 Canadian inspectors holding valid 1169 certificates of qualification issued by either the American Petroleum Institute or the Canadian Pipeliner Accreditation Council. The next recommendation is that companies include standardized code qualification for QC Inspectors by 2020. As companies have started mandating the 1169 and QC Inspector qualifications we have seen a significant increase in the use of other code qualifications organically. As organizations become aware of the code qualifications levels that are available it is only logical to use them within the Company systems. The net result is an industry with significantly reduced risk of incidents due to incompetence. Several reputable training organizations, including our own, are offering a full slate of training this fall to prepare individuals to challenge qualification exams. Because Simon Says You Shall! The Z662 Blog is Industry information and newsletter page for the North American Standards Assessment Corp.
Blog Purpose: To provide ongoing updates for available training and commentary for code and training issues dealing with Canadian Oil and Gas Piping Systems and regulations.